In this part of the lab I want you to modify your library from Lab 2 so that it can help you carry out a preanalysis of the situation described below. Imagine that you just landed a summer job as a geomatics engineer, and that your boss comes to you in the first week and tells you that the company needs to extend a primary geodetic network in the area of the town of Exshaw, which is not too far from Calgary, Alberta, Canada. Having heard that you took a class in geomatics networks, she wants you to do a preanalysis of the proposed extension to avoid excessive or inadequate field observations. And she’d like you to use a trial and error method based on the propagation of errors in different possible network configurations. 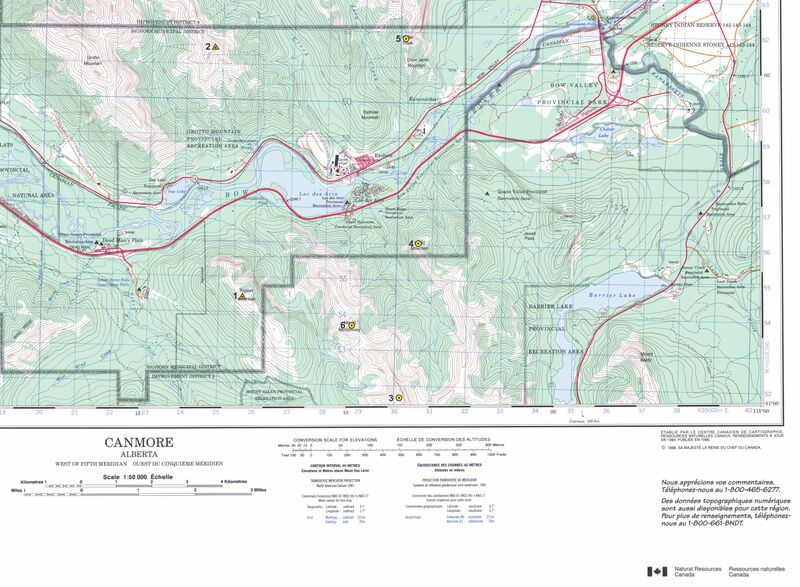 Below is part of a 1:50,000 scale topographic map you downloaded from Natural Resources Canada depicting the planned extension. The new stations , , , and will be positioned by conventional terrestrial methods using the control stations and . All stations are inter-visible except for stations and , i.e. there’s a clear line of sight from all of the stations to all of the others except between and . To be clear: you will need all of these stations. The question is how many distance measurements are needed between them in order the meet the specs published below. where is the distance between the two stations in metres and can be approximated using the initial approximate coordinates of the stations. She tells you that there are no specifications for the point confidence regions. And you’re told that you can assume the measurements that are going to be made will be uncorrelated, meaning that there will be no off-diagonal elements in the variance-covariance matrix . Your boss has asked you to submit a report to her outlining the situation, the results of your preanalysis, and your recommendations. Begin that report by summarizing the situation provided here. Use the map provided to get approximate values for the coordinates of stations , , , and . Use the grid lines to get the scale and, in order to ensure a reliable preanalysis, make sure you’re accurate to about m. Include these approximate coordinates in your report. Be sure to add the required format of the input file to your report and to the comments in your code. Use a sketch and some basic logic to map out the possible legs between stations that might be observed. Remember that there’s no point in observing between stations and , and that you can’t see between stations and . Give the legs a number and include those along with your sketch in the report. The whole point of this preanalysis is to determine the optimal network configuration, i.e. the minimum number of stations needed to meet the stated survey requirements. Now consider what are the possible network configurations. You’re doing to do a preanalysis of each of them and check whether the requirements are met. But first, how many configurations are there, and what are they? Include this in your report too. We have looked at the notion of a point error ellipse and the equations for the semi-major and semi-minor axes. Yet in this lab (see above) you’ve been given a requirement that relates to the semi-major axis of each 95% relative confidence region between new stations. To do this you will need to derive the equations for the semi-major and semi-minor axes of the error ellipse. Use what you know about propagation of errors, and include this in your report. It might also be useful to output some of this to the screen so you know what’s going on. Like you have done in other labs, I want you to create a Windows-based console application using Microsoft Visual Studio, and using the Eigen matrix. You can do this at any time and will need to press “Unlock the next lesson” in order to do this.